Paint may fade and iron rust, but the character of buildings only strengthens with age. 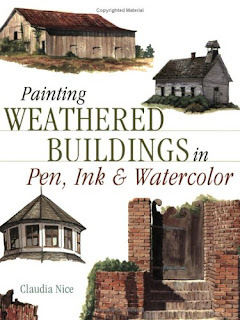 Join Claudia Nice as she shows you how to portray the mellow hues, weathered wood, cracked windowpanes and other imperfections that make old buildings perfectly wonderful subjects to paint. Using the exciting combination of pen, ink and watercolor, Claudia will help you discover the joy of painting barns, farmhouses, painted ladies, southern mansions and other beautiful, classic buildings. Like a treasured artist's journal, this book is filled with art, inspiration and handwritten notes, along with Claudia's friendly, step-by-step instruction. Claudia Nice is a native of the Pacific Northwest and a self-taught artist, developing her realistic art style by sketching from nature. She is a multi-media artist, but prefers pen, ink and watercolor when working in the field. Claudia has been an art consultant and instructor for Koh-I-Noor Rapidograph and, more recently, Grumbacher. Why are old buildings so intriguing? Could it be the hands that built them, using simple tools and passed down skills, that garners our curiosity and respect. Or is it the earthly materials they are made from--wood, stone and brick--that reminds us of ancestral times when man and nature lived closer together? Whatever the reason, old buildings are fascinating. They have a beauty all their own, clothed in dignified, sun-softened colors and weathered earth tones. Some stand proud and true to form, a credit to their builder. Others sag under the weight of years with missing shingles and broken panes. Yet these imperfections only seem to add to their charm, drawing people closer, as if we could somehow gather ancient wisdom by peeking into dusty windows and abandoned rooms. The word describing this longing is nostalgia. For those who have felt nostalgia as they entered the cool shadows of an old barn, or marveled at the details of an old Victorian dwelling, or simply stroked a piece of sun-warmed wood for the feel of it, this book is for you. May it please the eye of the one who merely wants to ponder the past, and inspire the artist who wants to capture both structural shape and mood with his own hand. Paperback, 144 pages; 100 color illustrations, 03/03.